Inscription on the Obelisk marking his grave: "Man will not always stay on Earth; the pursuit of light and space will lead him to penetrate the bounds of the atmosphere, timidly at first but in the end to conquer the whole of solar space." Konstantin Tsiolkovsky is currently considered a "single author." If one or more works are by a distinct, homonymous authors, go ahead and split the author. 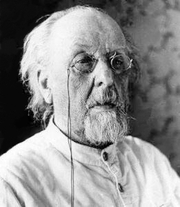 Konstantin Tsiolkovsky is composed of 11 names. You can examine and separate out names.